Kathryn Bertine is a writer, athlete, activist and documentary filmmaker. She is a professional cyclist with Happy Tooth Dental and BMW, two-time Caribbean Champion and three-time national champion of St. Kitts and Nevis (SKN). She is a native of Bronxville, NY. She holds a Bachelor of Arts from Colgate University and a Master of Fine Arts from the University of Arizona. Athletics have been a constant in Kathryn’s life since childhood. 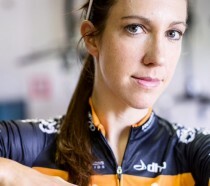 She is a former Division I rower for Colgate University, a pro figure skater, and pro triathlete–which lead to the beginning of her road cycling career in 2007. Off the bike, she is a journalist and author of three memoirs, All the Sundays Yet to Come; As Good As Gold; and The Road Less Taken. Kathryn is a former columnist for ESPN and espn-W, where she also worked as senior editor. As an advocate for equality in women’s sports, she started the social activism movement Le Tour Entier in an effort to bring parity to women’s professional road cycling starting with the Tour de France. Her film, HALF THE ROAD, is her first documentary.